Recharging your EV? Much slower. That’s why Chevrolet is introducing higher-speed charging on the 2019 Volt. 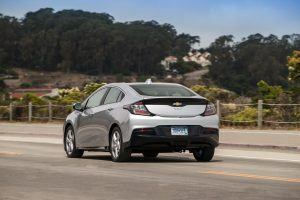 The Volt is a four-door, four-seat liftback that Chevy calls an extended range electric vehicle. That’s because it’s an electric vehicle (EV) with a small engine onboard to generate electricity. This eliminates those “range anxiety” fears that plague other EVs. Under certain circumstances though, the engine also sends power to the wheels. That’s what makes the Volt, technically speaking, a hybrid. In addition, you can plug the Volt into an electrical supply and recharge the battery that way. This makes it a plug-in hybrid. Clever. The Volt launched late in 2010, followed by a second generation in 2016. Over time the Volt has gained a larger battery pack—which means greater electric range. Trouble is, though, a bigger battery takes longer to charge. If you want to fill a bucket faster, you open the faucet more. It’s the same thing with “filling” the battery in an EV – you need more electricity to flow. The 2018 Chevy Volt has an 18.4 kWh capacity battery. Plugged into a 120V household supply it takes as many as 13 hours to “fill.” To speed this up the Volt can also be charged at 240V. That’s the voltage most electric ranges use. At 240V, charging time is around 4.5 hours. Running on electric power alone the Volt achieves 2.2 Le/100km. (“Le” is “liters equivalent.” That’s the same amount of energy as you’ll get from a liter of gas.) The combined figure comes out to 5.6 L/100km, based on a mixture of electric-only and gasoline engine fuel efficiency. For most EV owners range is a bigger concern than efficiency. The 2018 Volt will go up to 85 km on pure electric power, and can travel as far as 676 km on a full tank of gas and a full charge. If you’ve never driven an EV you could be in for a surprise. Whereas most fuel-efficient cars are a little snooze-worthy in terms of driving fun, the Volt delivers remarkably brisk acceleration. The other point to note is the softness of the ride. The suspension in the Volt is set up to give a very smooth comfortable ride. That makes it a great long-distance cruiser as well as an about town runabout. For 2019 Premier trim gains a six-way power driver’s seat, while all models get the Chevrolet Infotainment 3 system on an 8” (200mm) touchscreen. There’s also an improved pedestrian alert system, (needed because the Volt is really quiet,) and switchable adaptive cruise control. In addition, the regenerative braking system sees some changes. These let you manage how much energy goes back into the battery while slowing down. And last, there’s a new paint color and new patterns for the seat upholstery. The future of the automobile? Incredibly innovative when it first appeared, the Chevy Volt is still the benchmark for plug-in hybrid cars. But we could tell you about the Volt all day—the best way to learn more is by taking a look and actually driving one. Call us at Budds’ Chevrolet Cadillac Buick GMC to set up an appointment.